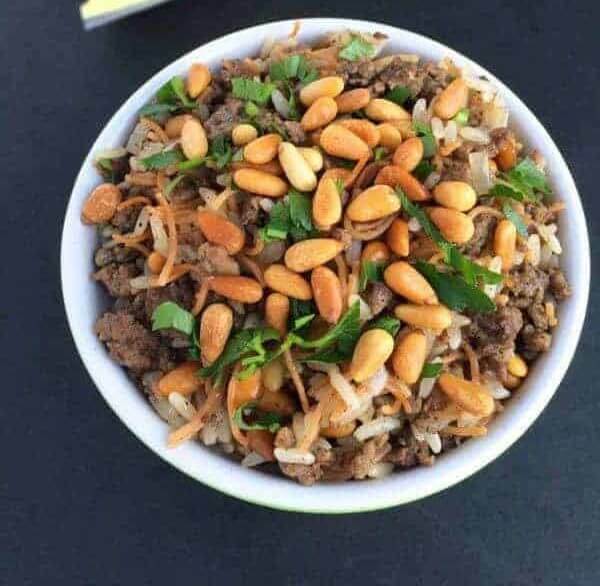 A family recipe passed down for generations, Hushwee Rice is a humble Lebanese side dish made with rice and beef flavored with warm cinnamon, clarified butter and toasted pine nuts. If I had to pick my last meal, it would be a buffet of Lebanese food prepared by my Aunt Paula with a giant bowl of this hushwee rice front and center. While others dream of mashed potatoes and stuffing, this is the dish we beg her to bring to Thanksgiving and Christmas every year. 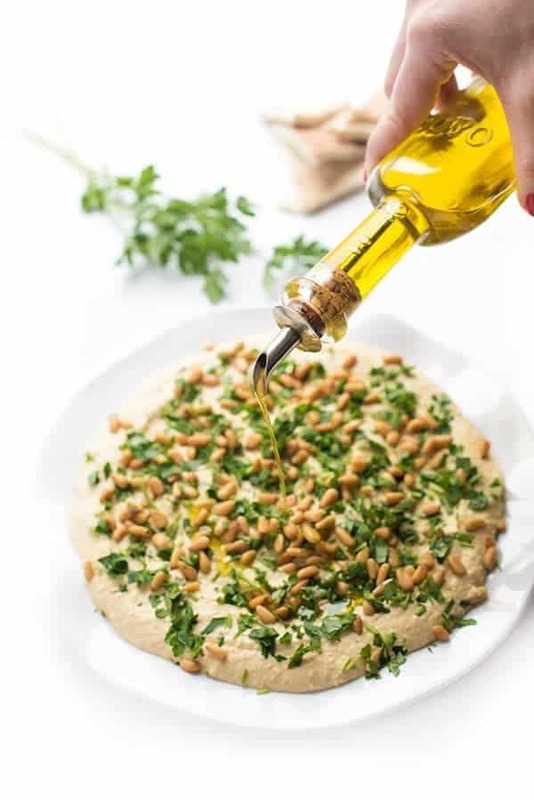 Made with clarified butter, warm cinnamon and toasted pine nuts, this irresistible side dish tastes delicious on its own or served with lemony Chicken Tawook and a giant Middle Eastern Green Salad. It is also traditionally served with roasted chicken stirred in the rice mixture. Honestly, though, you could serve it to me on a platter of mud and I would still clear my plate. The real star of the dish? A generous helping of pine nuts toasted until nutty and golden brown. This dish is rich, it is aromatic, it is comfort food at its finest. I’ve never met anyone who didn’t love it and I urge you to challenge me on that. 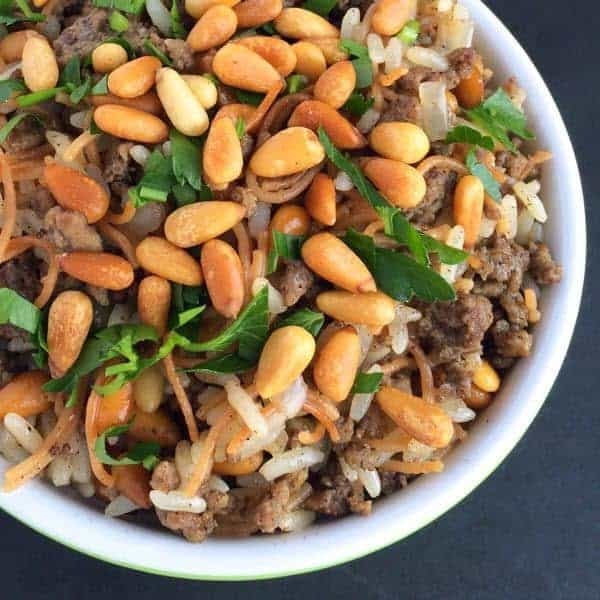 Hushwee Rice is a humble Lebanese side dish made with rice and beef flavored with warm cinnamon, clarified butter and toasted pine nuts. Prepare Lebanese Hushwee and set aside. While hushwee meat is browning, melt clarified butter in a deep skillet over medium heat. Add vermicelli noodles and toast until deep brown. Stir in rinsed rice and cook for 1-2 minutes to lightly toast the rice. Add reserved hushwee to the pan and stir to combine. Add chicken broth, salt and pepper to the pot and stir once. Bring to a boil then cover with a lid and reduce heat to low. Cook for 15 minutes, leaving the lid on the entire time. Fluff rice and meat with a fork then serve with additional toasted pine nuts and fresh parsley. Disclosure: I am honored to be a culinary ambassador for Diamond of California. Thank you for supporting the brands that make The Lemon Bowl possible. As always, all thoughts are my own. This is so, so, so good and the recipe turns out perfectly. Thank you for this! Yay I’m so glad you enjoyed it! One of my faves!! Do I cook the rice first then add a cup of cooked rice to the gushers? Or do I rinse the dry rice and add one cup of rinsed dry rice to the meat? How would you seasoning the rice differently, if you were preparing it alone? I’m guessing you’d just add some amount of cinnamon. I kind of want to adopt your family as my own. All your family recipes just speak to my soul :) So much goodness in here! Awww thank you so much!! You can come eat with my family any day girl! It’s meals like this that make me happy. Ones with a story and comfort behind this. I could see enjoying a bowl of it on a regular basis. Thank you so much friend – comfort is the perfect description of this meal! This looks so fresh and delicious!! LOVE the sound of this, Liz. SO yummy for a freezing Manhattan day. Hope you are well! xoxo Hugs! Although I am of Italian descent, once I was introduced to cinnamon in savory/meat dishes I was hooked. Probably in my genes as my family is from southern Italy. Can’t wait to try. And, the pine nuts just brings it over the top! I absolutely agree – isn’t it amazing how rich cinnamon can make a dish taste? Yummy!! That looks really good!! I don’t think I have ever had Lebanese food but I bet I would like it! 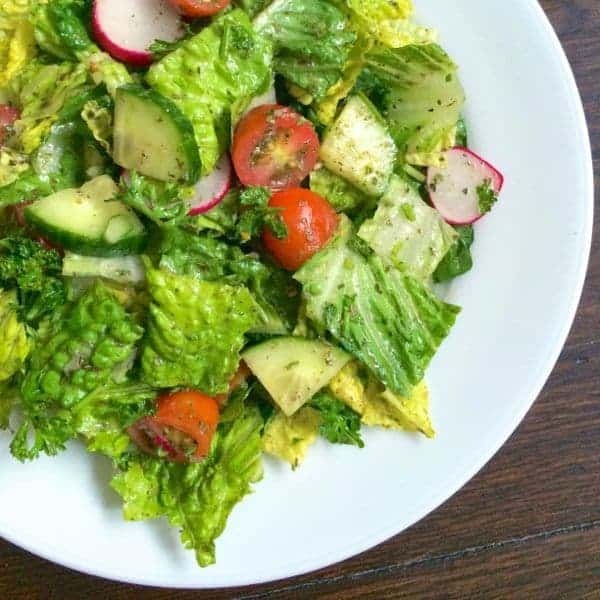 You must try it – super fresh and so healthy! 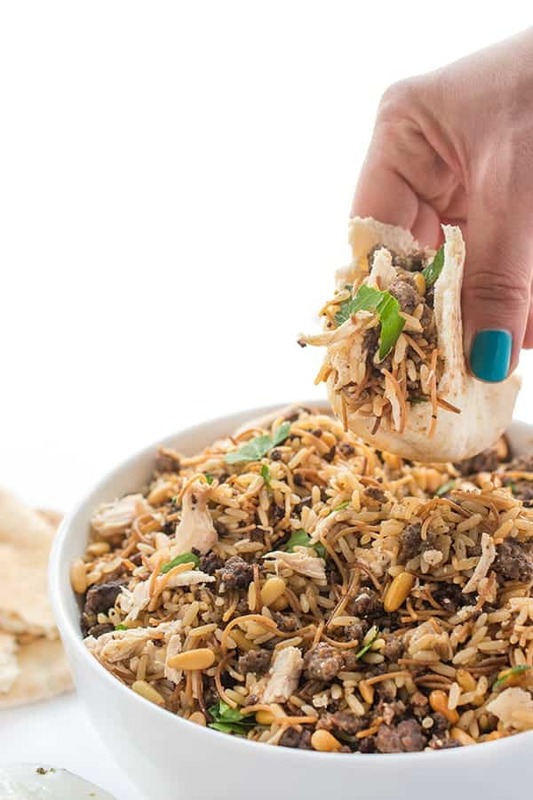 Liz, new reader here (found your blog through the fb group) and am already a huge fan- Just been stalking some of your recipes and we grew up on similar tastes (Mum’s middle Eastern)- Can’t wait to…keep stalking. I am obsessed with hushwee and now am going to get mum to make her Lebanese Pizzas. Oh I’m so glad you found me! Oh my goodness Lebanese pizza sounds perfect!!!! I need to make that for the blog! Lebanese food is the type of food I get the MOST cravings for, and um, nobody in my family, anywhere, ever is Lebanese. haha :) I’m just spoiled with a great Lebanese restaurant here in Ferndale, but I really want to start making some of these great dishes at home. My favorite is mudajara, but this would rank right up there, too! You are SO lucky with all of your Lebanese restaurants!!! We ate at a Lebanese restaurant last week and couldn’t keep our forks off each others’ plates! This rice dish looks spectacular! Isn’t Lebanese food the best?? Thanks Liz! I love treasured family recipes like these! Also, pine nuts are so wonderful. They make any dish special, and they look just perfect here. Thank you my friend – I totally agree with you on the pine nuts!